I’m honored to have Bryan Fischer with me this time. 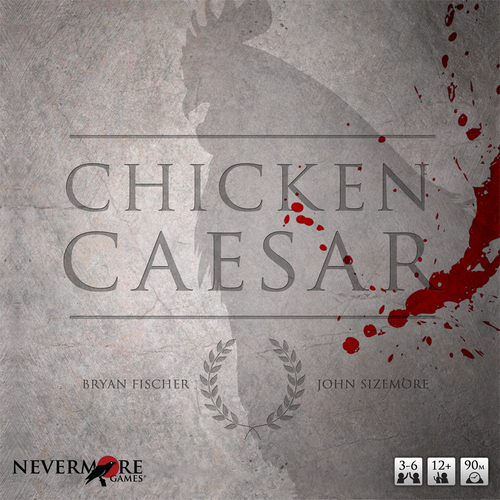 Bryan is the co-founder of Nevermore Games and the designer of Chicken Caesar. First Bryan, tell us a bit about your gamer history. What game got you hooked? I’ve been gaming in one way or another for as long as I can remember. I got started in Magic: The Gathering and Dungeons and Dragons at a young age. Unlike many other strategy gamers, my first strategy game wasn’t Settlers or Carcassonne. I picked up Citadels on a whim back in 2001 and haven’t looked back since. You’re a game publisher AND a game designer. Let’s talk about the designer first. Chicken Caesar is the big one so far. Tell us about it. I’ve designed, tweaked, tested, illustrated, graphically designed, marketed, published, played, and demoed Chicken Caesar. In all of that, I’ve ended up playing Chicken Caesar twenty times for every one time I’ve played even my favorite games. It would be easy and probably normal to never want to play it again after all of that. And yet, I still like to play Chicken Caesar. 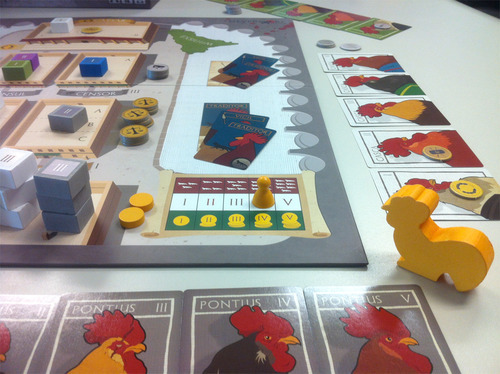 Chicken Caesar is the game for gamers who like table politics. In my humble opinion, it’s more streamlined and faster than Kremlin without losing any of the complexity. It’s nastier than even Intrigue, which in my mind is pretty hard to beat. And it gives players the opportunity to be as subtle or obvious with their intentions as in Lifeboat, one of my favorite games. I’ve heard very good things about Kremlin so if it’s similar fantastic. How did you end up with chickens? I mean, chickens. Funny story. My wife and I were riding down interstate 95 and I was talking her ear off about game ideas I had when she put her chicken caesar wrap down and laughingly said, “You should make a game called Chicken Caesar.” Genius. After that, the game went through various forms. It started as a card game where players were senators trying to assassinate a very suspicious Chicken Caesar. After a few playtests I knew I didn’t want to go in that direction, but I wasn’t sure where I wanted it to go. It was around that time that I was exposed to some new game concepts during my daily lunch gaming at work. Games like Intrigue, Dragon’s Gold, Quo Vadis?, and Kremlin gave me a taste for games that depended on the players to be brutal in order to get the upperhand. I saw how much fun those games could be while also witnessing sore feelings that often arose. In my mind, it was right around then that Chicken Caesar was born. Players can be super ugly to each other, but for some reason because everyone is a chicken there are less hard feelings. I don’t necessarily understand it, but it works! It sounds right up my alley. I appreciate a good backstabby game. Now, you had a successful KS campaigns with Chicken Caesar. Talk about that. Running a Kickstarter is a very stressful and wonderful experience. If you want your Kickstarter campaign to be successful, you need to put at a lot of time and effort into your game plan. Our first time on Kickstarter netted the project 200% of its goal and we were thrilled. We had worked hard to plan for the campaign. Even after shooting one of the worst KS videos in existence, we were pretty confident that if people really took the time to check out the project, they would want to back the game. Then again, maybe I’m just forgetting how scared we all were when we hit that launch button. The campaign was a ride and we learned a lot as we went along. When it was over, we knew that our work as a publisher was only getting started. 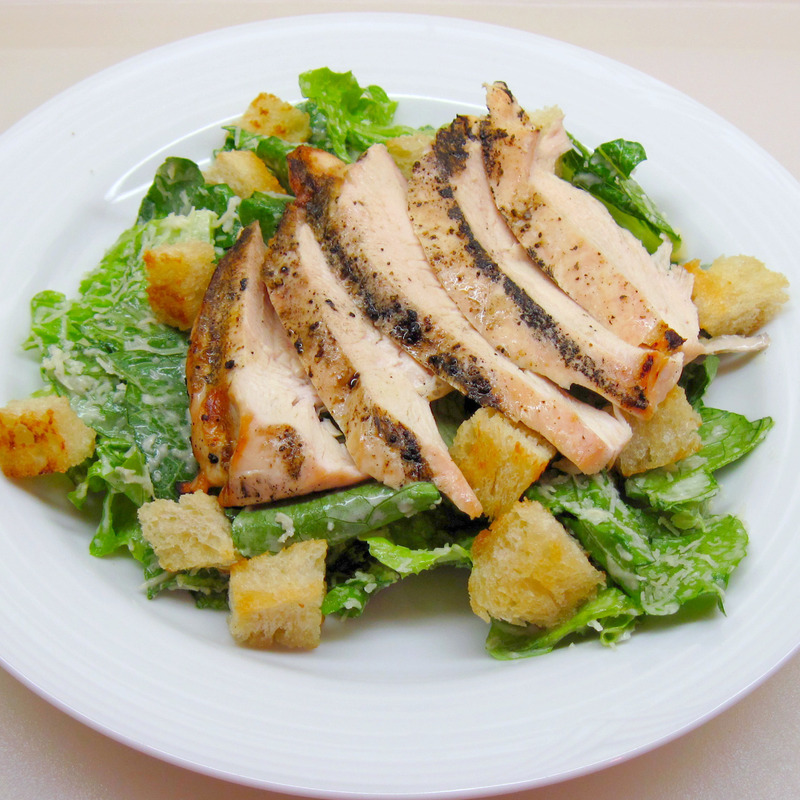 Kickstarter was invaluable in bringing Chicken Caesar to the masses. It will be an invaluable part of all Nevermore projects for the foreseeable future. You were at Unpub4 is that correct? Tell me about how it was for you. I sure was! I went to Unpub3 last year as a publisher and did the normal publisher thing. I supported a designer at the convention, as well as, hunt for possible titles. I went up by myself that year and had a great time. Unpub4 was very different for me. John Sizemore (co-designer of Chicken Caesar) went up with me and we both went primarily as designers. I was going up with Pie Factory and he had an early prototype of his upcoming game (title not yet set in stone, but tentatively referred to as Crovuli). We had an incredible time demoing our games and playing others’ games. I spent roughly half of Saturday with a migraine and still managed to enjoy myself. Darrell Louder, with whom I participate in the Boardroomers live web show, ran an impressive Unpub this year. As it continues to grow, he has given it legs and organized it well. I love pretty much everything about Unpub. It’s always fun to sit down at a table with a receptive designer, play their game, and then discuss ideas/suggestions about their game. It’s great to sit on or watch the publisher panel on Sunday morning. It’s great to see my friends that I generally only see at conventions, and in such a casual environment. So talk about Pie Factory. It got a lot of buzz at Unpub and DHMG picked it up as one of its Rabbit line for 2014. First, how does it feel for another publisher to pick up one of your games? Validating. That’s how it feels to be picked up by another publisher. When you design and publish your own games, even one as well received as Chicken Caesar, there’s always a part of you that wonders whether or not you would be published by someone else. At least, I had that feeling, not that everyone necessarily has it. Regardless, I decided to try and see what happened. I contacted Chris Kirkman prior to Unpub and he agreed to play the game there. Chris was a super busy man at Unpub4 between his 54-card game contest and other scouting duties. I knew I only had a short time to show him the game. I managed to get the demo in on Sunday just before leaving the convention. He loved it and contacted me two days later with a contract. 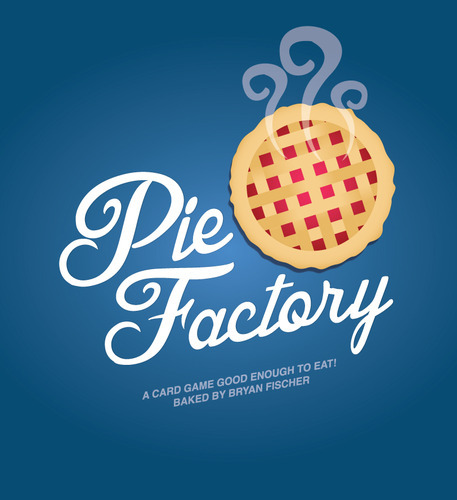 Pie Factory is a game designed specifically for a 54-card format. The game is super tight and forces players to make decisions with a limited timeframe. I came up with the theme idea about a year ago and said to myself, “hmm, this would be perfect for the Dice Hate Me brand.” I didn’t start making the game until much later, but I suppose you can say this game was crafted specifically for Dice Hate Me Games. Chris is in my gaming group so I’m sure I’ll get a chance to play it. Comment on being in the DHMG family. Were there any other ‘suitors’? Why did you choose to sign with Chris? I’ve known Chris for a couple years now and he’s a really good guy. The Dice Hate Me Games brand is probably my favorite in all of gamedom. He’s crafted and nurtured something special in DHMG. To put it simply, I’m honored to be a part of it. With Pie Factory, there were no other serious suitors. I showed the game around a bit, but it was pretty obvious to everyone else that this game was a Dice Hate Me Games title and should be. I’m glad Chris agreed! Give me the run-down on the game. Players take on the role of workers in a Pie Factory, competing for the big promotion. They have two days to prove to their boss that they are the best person for the job. In order to do this, players will need to make and box a bunch of pies while gaining influence with the higher-ups. Gameplay wise, Pie Factory is a card game that utilizes drafting, a time track, set collection, and hand management. On a player’s turn, he/she has the option to draft an Ingredient card from the Assembly Line (some are free, some aren’t), or play a card from their hand in order to start a new pie or add onto an existing one. Every Ingredient card has a Prep Time which affects the player order for the next round. On a player’s turn, the player also has the option of drawing directly from the top of the deck or Boxing pies (score pies they’ve made), but doing so will cause he/she to go last next round. It’s even possible to draft cards directly into your hand, but it takes finesse. 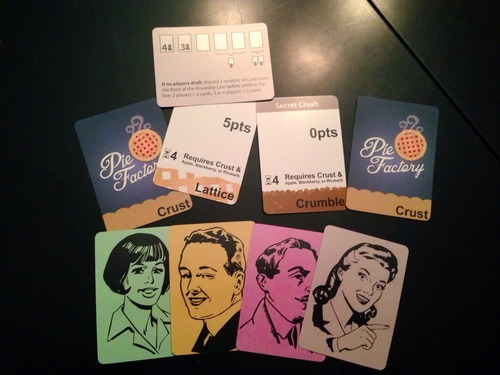 Players build pies by starting with a Crust, a type of Ingredient card. There are Crust cards in the game, but also any card can be played face down as a Crust. Played on top of the a Crust is a Filling card. These include Apple, Pumpkin, Chocolate, Key Lime, Rhubarb, and more. On top of some fillings, Toppings can be added. For instance, a Lattice topping can be added to an Apple Pie. A Meringue topping can be added to Lemon. Many of the Ingredients cards have special icons on them indicating a higher-up they will gain influence with if they box/score that specific card. You can gain influence with the Secretary, Foreman, President, and even the President’s Grandma. Having the majority of influence with these higher-ups will earn you bonus points at the end of the game. When you box pies you only score the topmost card of a pie, so sometimes you have to not add that fillings or topping in order to get the higher-up icon you want. The gameplay is pretty tight. Players have a maximum hand size of four cards and can only build three pies at a time. They have a limited number of turns to impress their boss and there’s a possibility some of their pies will go stale. The game is quite beefy for only being 54 cards, and the replay value has already proven pretty incredible. There’s more I could say about the nuances and mechanics, but let’s leave that to the Kickstarter campaign! The game sounds great. I can’t wait. You had a pretty unique promotion for Pie Factory at Unpub. Tell me about the pies. Early on in playtesting, I heard “now I wish I had pie to eat” from a lot of playtesters. 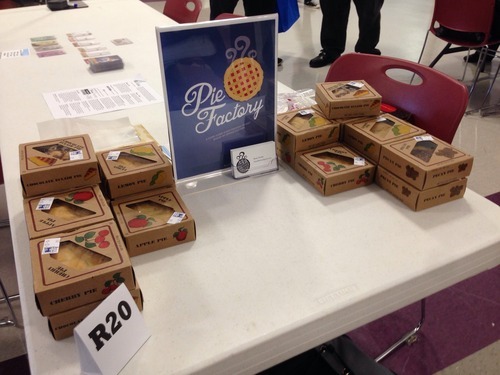 I started serving pie while testing the game, and I decided to continue that at Unpub4. I bought 25 or so mini pies of various flavors and displayed them on the table. While I demoed the game, players were welcome to eat a pie or take one with them afterwards. Most people shared pies or came back later to grab one and I went through all of them. Why would anyone want to play a game about pie without also eating pie? Haha, this should totally happen. Chris needs to bake the pies himself, but I have a feeling it would be Pecan every single month (it’s his favorite). I’m partial to chocolate myself. Last pie question: If you were a pie, what type of pie would you be? Ok, back to game design. Are you working on any other designs of your own? Yes, always. I have several in the works, though once I finish up Pie Factory rules and art (I’m doing the illustration and layout) I will be focusing on one at a time and moving through the queue. Putting your publisher hat on for a minute. How many submissions do you receive each month? What should a designer do if they want to submit a game to Nevermore? 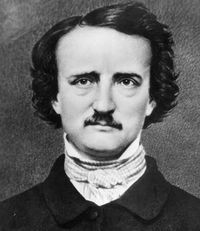 Nevermore isn’t currently accepting submissions, but when we were we saw around ten or so “submissions” a month. Most of these were emails with a pitch and prototype art, but a few times we received straight up prototypes in the mail. This isn’t the ideal way to contact a small independent publisher about your game. What we prefer, and I’d say that it’s the recommended method shared by all of the indie publishers I network with, is to be contacted in advance of a convention we are attending with intention of meeting us at the convention. This works. About two weeks before PrezCon (Charlottesville, VA) Ben Rosset emailed me and mentioned that he had 2-3 games he’s like to show us at the convention. We set up a time and met with him. He had a game called The Market with him, which within days we signed. It would later become Mars Needs Mechanics. Mars Needs Mechanics is a fun game. What made you sign it? When Mars Needs Mechanics was still The Market, the game was only the sales order line. This is the core of MNM and it’s so tight that we knew we loved it right away. Ben was open to adding a level of complexity to the game and we really thought it had the potential we were looking for. When we found Mars Needs Mechanics we also found its great designer. Ben Rosset is a game design machine. He’s methodical and dedicated. He holds up his end of the bargain (designing, building, testing, tweaking) and then some. We had a really good feeling about Ben when we met him and that means a lot to us. Nevermore wants to publish good games, but we don’t want to work with jerks. Ben had a great game and he’s a nice guy. It was a perfect match. Ben Rossett is a very good designer. Pie Factory will actually be sharing a Rabbit pack with Brewcrafters: The Card Game. How do you feel about that? I feel great about it. Ben is a good designer and friend. I tested Brewcrafters early in its life and I’m excited to be sharing a game pack with its little brother. Who do you use for production? We used Panda Game Manufacturers for both Chicken Caesar and Mars Needs Mechanics. What’s the production process like for Nevermore? Talk to me a bit about that. I think our production process is pretty similar to other publishers, but if I could emphasize two points, they would be Art Schedule and Component Quality. We want to have the art almost entirely done before we launch Kickstarter. This is important to us because we want the backer to be able to see as much of what we’re proposing as possible. It’s rarely possible to have all of it done, due to stretch goals and the like affecting art, but it’s very possible to have 90% of it ready to go. Nevermore does not skimp on component quality, period. Both of our current titles have thick punchboard and quality cards, excellent printing standards, and solid boxes. We want our games to be the kind you want to keep in your collection because they aren’t only fun to play, but great to look at. You games are very well produced. Any publishing horror stories? Any publishing miracles or raves? Both. Mars Needs Mechanics ran considerably late due to a horror story that I won’t go into at length. Let’s just say it involved the loss of a job, the loss of a computer, and ultimately the retrieval of the files for MNM (thanks to a very helpful person) so that I was able to finish the game. Sometimes it’s hard for backers to understand why projects run late, and sometimes they run late for very silly reasons. In the case of MNM, we had a very legitimate reason and our backers were super awesome at understanding this. Panda Game Manufacturers also proved to be awesome during that process. As if we couldn’t get any more delayed after the files fiasco, our boat decided to delay its departure for unknown reasons, then we got surprised by a random customs inspection, etc. Richard at Panda was amazing in coordinating all of this and helping us every step of the way so that we would have experience on our side to make up some of the lost time. We playtest quite a lot and we do it almost entirely locally for the most part. We have several dedicated groups of gamers in Richmond, VA who test our games. In addition, we have some people here and there who have demoed or tested our games in the past. And of course there are conventions where historically we have playtested almost the entire time there. And yes, of course you can. We haven’t made prototype files available for remote testing in the past, but that hasn’t been because we didn’t want to. We simply haven’t needed to, but we’re more than willing. Ken Grazier from Geek-Craft.com will be testing Pie Factory for me with his group in Ohio, and that’s actually a first for me. Does Nevermore have a design philosophy? Do you have overarching design goals? No dice. Haha, not really, but not far off. We fully intend to publish games that emphasize strategy and limit or contain no luck. Chicken Caesar is a luck-free game (baring player generated chaos, which you can never really eliminate). Mars Needs Mechanics is a game with considerable information, creating an almost luck free environment. The only information you don’t have on a turn is the original cards players were dealt. The draw of the deck on each turn is part of the commodity speculation engine. Design goal wise, we have some projects we would like to do. We’re pursuing creating more bird themed games. These games will be strategic share an anipomorphic lineage. Chicken Caesar is the first in that line, and it will be followed by others. It’s always been a dream of mine to publish a horror/mystery themed game. Having a company named after a famous line from the founder of the detective novel, Poe, you’d probably expect something like that. We have other goals as well, but you’ll have to wait and see! I’d love to see a well done mystery game. That would be a real winner. Having a theme is an interesting idea. I can see how that would help with brand recognition and designs. 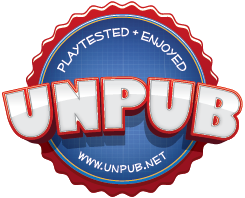 What’s your favorite unpublished game right now (beside your own)? 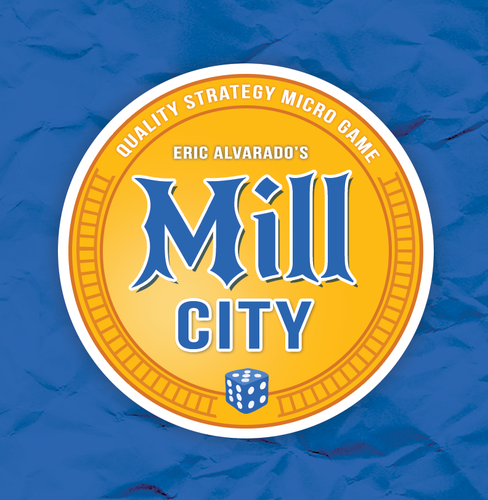 Definitely Mill City by Eric Alvarado. Eric made the game for my unofficial Unpub 3 mini-game contest and totally nailed it. It’s a euro played with minimum components. Its strategy is deceptively subtle and its play time is nice and short. Sounds cool. What are you currently playing the most? I play different games with my different gaming groups. With my lunch group at work, it’s been mainly Biblios and Council of Verona. With my wife it’s been primarily Kings of Air and Steam, and with my regular game night group we’ve recently played Euphoria, Troyes, Lewis & Clark, and Elder Sign. I really need to get a lunch group going. So, favorite game played in 2013? This is going to be a non-standard answer. Lords of Waterdeep iOS. By far the best iOS board game app to date (at least in my opinion), LoW has soared above expectations. I really enjoy the quick gameplay and seamless transition from physical game to app. I need to buy that one. What game surprised you and how? Lewis & Clark really surprised me. Based on the art alone, which is absolutely gorgeous, I was actually expecting a medium complexity game at most. The game is much heavier than I expected and the first time you play your brain is smoking at the wheels are turning and turning with no traction. It’s a great game that I can’t wait to dive into even deeper. I’ve heard both good and not so good things about Lewis & Clark. The theme certainly speaks to me. I’m a history buff. I even have notes in my game design notebook for a L&C game. Do you see any trends in the gaming industry that you would like to bring up? Microgames? More POD? Anything? I fear that microgames might have been born, nurtured, and then bludgeoned to death already. On the Boardroomers last year we were speculating “the next big trend” in the industry and I said “microgames.” It started happening in a big way, but since Kickstarter has been flooded with so many of them that I can’t imagine this lasting much longer. It’s a real shame for people with legitimately good small games as they might not get on Kickstarter before the microbubble bursts. Who knows though, I could be very wrong. That’s a good point. It does feel kind of like we might be on a microbubble. What is next for you? What else is in the Fischer and Nevermore queue? Do you have any bombshells or exclusive announcements you can reveal for Go Forth readers? I’m finally coming down from a ridiculously busy time for me. I’ve started a new career, I’ve been working on the graphics and illustration for Captains of Industry (Tasty Minstrel Games), and of course I’ve been building Pie Factory. After I’m done with Pie Factory the plan is to take a three week break and then jump onto the next game which, at this time I won’t reveal. But, get back with me in two months and I’ll have something to share, haha. What was the last good movie you saw? And the last bad movie? I’ve seen good movies since this one, but a first time viewing that stands out recently has been The Shining. Yes, I haven’t seen The Shining before just a few months ago. It’s sad. That film is pretty incredible. I don’t finish bad movies. Is there a particular historical period or subject you feel is underrepresented in game themes? I believe that some themes are really hard to do as board games. Mystery or Horror games are really tough to do. The Arkham Horror does it well, but even then it’s all about setting a mood. It doesn’t deliver on actual mystery or horror. That’s just something that is really hard to do. To actually bewilder or scare someone in a board game, now that’s tough. You need to play Dread, the rpg that uses a Jenga tower. Intense is too small a word for this game. How can people contact you? Are there any links you would like folks to visit? You can always find me on Twitter @bryanfischer. Nevermore Games is also on Twitter @nevermoregames. You can get Nevermore Games games at your local store or online. If you want to get your hands on Limited Edition copies of Mars Needs Mechanics or the Fowl Play expansion for Chicken Caesar, visit our online store: http://nevermore-games.myshopify.com/or checkout http://nevermoregames.com. Pie Factory will be on Kickstarter this Spring. Check out http://dicehatemegames.comfor more information. Games are supposed to be fun. Always remember that. It’s easy to get wrapped up in the details and forget that. I think the board gaming industry does a good job of perpetuating fun and I’m proud to be a part of it. I’ll keep making games as long as people keep enjoying them.